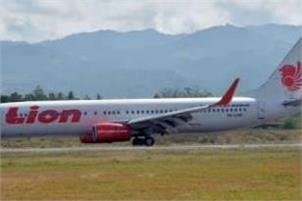 A Lion Air Passenger jet crashed into the sea soon after takeoff from Jakarta, Indonesia on Monday. It was carrying 181 passengers including one child and two babies, and seven crew members. Indonesia's disaster agency spokesman Sutopo Purwo Nugroho posted photos on Twitter of debris including a crushed smartphone, books, bags and parts of the aircraft fuselage that had been collected by search and rescue vessels that have converged on the area. Indian Pilot Suneja was the Captain of the plane. The budget carrier crashed in the Java Sea, Indian Embassy confirmed. The 31 year old pilot was flying the Lion Air flight JT610 which lost contact with the ground officials 13 minutes after taking off from Jakarta Soekarno Hatta International Airport. The Boeing 737 MAX 8 aircraft en-route to Pangkal Pinang city crashed near Kerawang, 32 miles east of Jakarta. Indian Embassy in Indonesia said in a tweet, "Our deepest condolences on the tragic loss of lives in the Lion Air Plane crash, off the coast of Jakarta today. Most unfortunate that Indian Pilot Bhavye Suneja who was flying JT610 also lost his life. Embassy is in touch with Crisis Center and coordinating for all assistance." The co-pilot was Harvino with other six cabin crew members. In a statement the airline said, Suneja has 6,000 flight hours and the co-pilot more than 5,000 flight hours. Originally from New Delhi and attended Ahlcon Public School in East Delhi's Mayur Vihar Captain Suneja was a resident of Jakarta. In August the plane was delivered and had 800 hours of flying time. About 30-35 meters depth, it sank in waters, north of the coast of Java island. The aircraft was declared operationally feasible, the airline statement said. For the investigation team the top priority would be finding the cockpit voice recorder and flight data recorder to help determine the cause.